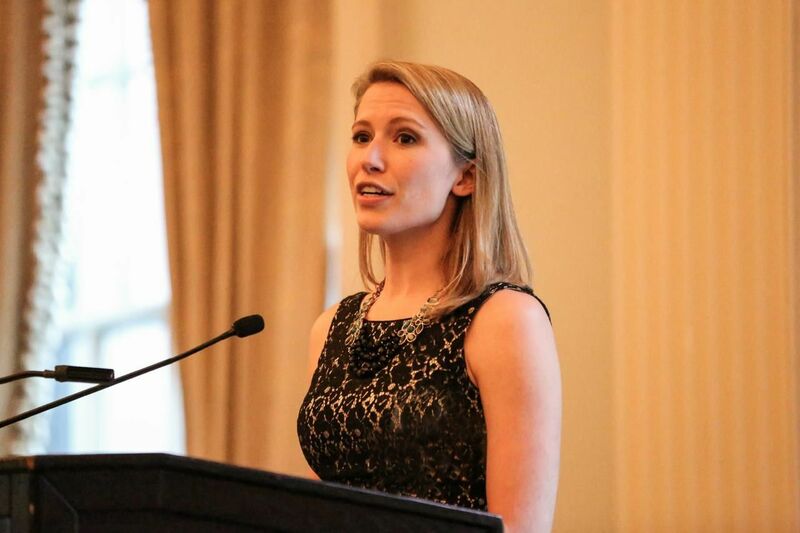 Ten years ago this summer, when she was a junior at Carolina, Hadley Heath Manning ’10 landed a research assistant internship at the Independent Women’s Forum (IWF) in Washington, D.C.
“And I never left,” she laughs. Today, Hadley is director of policy at IWF, a politically conservative organization dedicated to policies that enable more individual choice. The all-female staff works to inform American women on policy issues like paid leave, health care, taxes, energy, minimum wage, and education. Hadley’s team generates content for the organization’s policy publications. And it’s clear Hadley is good at what she does: In 2015, the Republican National Committee honored her as a “Rising Star.” In 2016, Forbes named her to its 30 Under 30 list in law and policy. Hadley—who now lives in Denver, Colorado, with her family—says she loves being able to work for a cause she believes in. But she strives to be mindful about her role in the national discourse. “During a time when the national conversation seems not just more contemptuous but also more cynical, I try my best to have a voice that is more positive and does not paint my political opposition as the enemy,” she says. Hadley says this challenge is particularly front-of-mind when she speaks on broadcast television. Hadley says that, for her, an important part of that intentionality is staying open to hearing viewpoints that contradict with her own. Hadley says she strives to read news from a variety of outlets, and she nurtures close personal relationships with people who disagree with her politics. When it comes to increasing the number of women in politics, Hadley says one of the challenges for the Republican Party is that conservative women are more likely to be stay-at-home moms. “My theory is they’re more likely to be family-oriented, which reduces the pool of people we’re talking about,” she says. But women can be politically active without running for public office. Hadley considers it a privilege to live in a country where women can choose to stay at home with their kids, or to work outside the home full-time. Hadley says she’s grateful that IWF allows her to work remotely and set her own hours. Despite her national honors and her frequent appearances in national news outlets, she says the greatest accomplishments in her life so far have not been professional—they’re her family. Hadley is married to a fellow Morehead-Cain, Aaron Manning ’10, and they have two young children, Madeline and Jack.